Venus Smileygal: 30 Day Blog Challenge: Day 16 - Happy Foursquare Day! 30 Day Blog Challenge: Day 16 - Happy Foursquare Day! 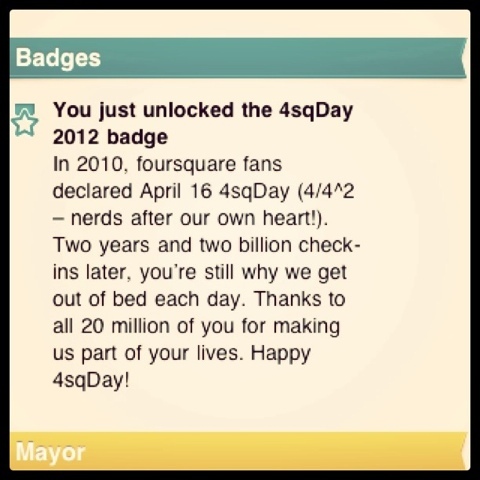 First of all I would like to great everyone a happy 4sqDay! For those of you who doesn't know about what is this day about. Read this.. I wont deny, I am a foursquare addict! everywhere I go I made it a point to check-in, leave a tips for other to read and take photos of the place. For me its the best way of promoting local business and establishments here in Cagayan de Oro. It is also a unique social media sharing that enables people to share feedbacks and good info's on the place which is why I made it a point to also check-in and leave a useful comment and updates.